IN 1938 AND 1939 WAS BELOW THE 1910-14 AVERAGE. 1939 of 254 million bushels and production of 755 million bushels. wheat, c.i.f., duty paid, at Buffalo. with 395 million bushels in the same period a year earlier. able apprehension as to the condition of the crop. estimated to be about 250 million bushels more than for the preceding year. estimate is 12 million bushels smaller than the estimate of a month ago. year earlier, nlth: g.ih rye supplies have been almost as large as last year. be no rye exports from the Soviet Union were also important price factors. a year ago, and the carry-over next July about the snne as last July. report exclude the U. S. S. R. and China, except where noted. from 1924 to 1933, largely as a result of increaPsd acreage. again largo -- the largest on record (table 12). expected to be somewhat less during the current season. and by poor crop prospects in Argentina o.d the United Sta.tes. an upward revision of 24 million bushels in the estimate for Australia. Australia, at 210 million bushels, compn-ard with 154 million bushels last year. ting, and these cou.ntrios now total 1,717 million bushels. report eclud1e the U. S. S. R. ead China, except heree noted. 1922 are shown in table 12. I Excluding stocks and production in Soviet Russia and China. United Stcats, figures for which were available only beginning in 1937.
and stocks afloat are not available. included in this issue as tables 13 to 15.
hindered sewing. Var conditions r.lso interfered with st einr s in some sections. the acreage of spring snwn will probably be increased. extent of the potential injury cannot be reckoned until later in the season. In Beigiuz tle outlook is unsatisfactory. total area is expected to exceed the very large area sown last year. ago. The condition of the cro-, is now reported as good. changes in Buenos Aires groat3r. high and low prices was more than 4 cents (table 5). I/ Conv rEions at noon buying rate of exchange. 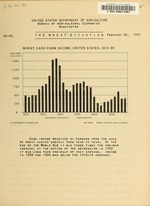 SJanuary 6 to February 17, 1940, and corresponding dates for 1939.
of 74, 85, S3, and 103 cents per bushel, respectively. of soft red winter decreased 23 million bushels and white 19 million bushels. l/ Comparable series of July 1 stocks contains some new wheat. and on July 1, 1939 of 254 million bushels. include wheat and flour made wholly from domestic wheat. result of a reduction in wheat feeding. beginning with 1923, arc shown in table 8.
somewhat higher price per bushel. sum of the State estimates. orderly liquidation of wheat loans also have contributed to the rise. February 3, and 109.5 cents for that ended January 6. Canadirn wheat, c.i.f., duty paid, at Buffalo. which occu-rr d withljut subsidy. of spring wheat t t ,Minneapolis are relatively lower in 1939-40 (table 6). Vi Weekly average of daily cash quotati-'ns, "i-ss ITo. 1 so.ckSd. / J-anuary 6 ?cbrut.ry 17, 1940, rand corresponding dates for 1939. 1J United StoAn pric.-r a.re wei h+..-d on ihe b-asis of reported carlot sales. 1/ 7'eighted by sales in each State. j 1923 to 1926 Bradetreet's, excluding country elevator stocks. absence of actual fires; 1930-39, Burmea of Cenus figure raised to represent all merchant mills. for changes in carry-over; beginning 1935 figures for exports of foor holly from United States wheat. Includes durum wheat returned from Montreal, estimated at 1.90.000 bushels. 6/ For 19q7 excludes new wheat estimated at 12.500,000 bushels; for 1938 excludes 13.123.000 bushels and 193?. 23.975.000 reported as new wheat by Bureau of Censue. I/ Shipments are to Alaska. Hawail, Puerto Rico, and Virgin Islands (Virgin Islands prior to Dec. 31. 1934.
f/ For individual items, see eupoly section of this table. Bureau of Agricu tural Economics end Agricultural Marketing Service. V a:il. bo Mil. bu. Mil. bu. Mil. bu. in the average. 2/From reports of Foreign and Domestic Commerce of the US. and include wheat, and flour made wholly of domestic wheat. / Balancing item. in mc:rchalnt mills and elevattors. milling in bond, also flour from r-;pcrts of Bureau of Domestic and Foreign Commerce. reau of Domestic and Foreign Commerce. stocks, including stored for others. 1j Excludes U.S.S.R. and China. Includes some new wheat in United States commercial and merchant mill stocks. is combined with the Southern Hemisphere harvest which begins late in 1939 and ends early in 1940. Grain, Seed and Oil Reporter. P :maa / ......: 252 --- 1 1 4/ 1 . Includes Canal Zone and Republic of Panama. Compiled from official records of the Bureau of Foreign and Domestic Commerce. Compiled from official records of the Bureau of Foreii rind Domestic Commerce. 2/ To convert to wheat equivalent multiply by 4.7. SIncludes Canal Zone and Republic of Panama. Principal exporting :1.000 bt 1.000 bu. 1l Wheat only beginning 1919. / Beginning 1935 exports are all domestic wheat and flour "made from wholly United States wheat". 1/ International Tearbook of Agricultural Statistics. for the period September December 1938. Compiled from official sources, except as otherwise noted. 100oo0 1.000 b. 1.000 bu 1.000 bu. 1.000 bu,. 1.00 b. Compiled from reTorts of the Department of Commerce. Compiled from Br;oomhalls Corn ..rae iews. _J Thro. :-h September 2 only. j/ Includes flour milled in bond from foreign wheat. Excludes land trade for August-October 1939. ~J/ Broomhoall's Corn Trade I'rv:s.
ances of wheat, and estimates of flour shipments. 6/ 0 [ cial reports received from 16 principal ports only. 7/ T7:rcgh September 2 only. 8/ iacic Sea shipments only. adrs notu include items 2 and 3.
: l. bu. I,.il. bu.. T.. bu. Mil. bu. Compiled from official sources except as otherwise state.d. Net exports of less than 500,000 bushels. ac:e,-:e was gr3c.tly reduced because of heavy abandonment. of 23 million bushels and a production of 39 million bushels (table 20). in 1937-38 it was 39 million bushels. the same as at the be-innin;. low a year earlier and 15 points lower than the 10-year (1927-36) average. If Less than 500 bushels. bu. bu. bu. bu. bu. bu. prices since July have been considerably hi,.her this year than year earlier. 'ushels under lona in the United St'-tcs, we-e also irnort-i.t rice factors. to Jzan-u.y 1940 in table 23.
lo rway ..... .... ..... .
1 Includes Austria and the Sudetenland. 1912 : .0.R 7,4.4 7C.- 6.4 67.6 65.0 66.4 66.C 63.C C2.6 C3.2 63.6 05.C. 1924 : E>. ; '.9 80.1 105.7 108.6 112.7 126.2 132.2 125.1 100.9 103.6 101.8 95..
1931 : 33.0 32.5 3..2 3:.' *. i 0. C. 27,7 3.0 33.4" 28.8 34.
averages for the crop marketir.g season. Crop -year July : Aug. Sept. Oct. : Nov. Dec. If Figures beginning with 1915 in The Theat Situation, June 1937, page 18.
: Dec. : June : year : Dec.- : June : year : Dec.
/ Poland. 2/ Iceland. z/ Nicaragua 179 bushels; Panama 27 bushels. Country __ __ :_ _~ _____- __ :. r: Iil. I.il il. Mil. Mil. Mil. Mil. Mil. Mil. Mil. Principa-l e- : Lu. bu. bu. ,,u. 1u. bu. bu bu. bu. bu. and Sudeter.1 nd (Czechoslovokia) for the period September-December 1938.